SAI Angan, an initiative of SAI International School is a new concept in experiential learning, through each classroom that is synonymous with all the elements of the best playschools of global standards. The playschool with a total area of 1,50,000 square feet is India’s largest and a trendsetter in Early Childhood Education. The playschool provides the much desired 360 degree learning experience onto each child inspiring them to be learners with permanence and quality. Serving as platforms of self discovery the learning areas ignite innate curiosity within each child, synergized by the extremely competent faculty who are specially trained for the early group learners. The playschool is a hub of well planned activities that enable, empower and encourage the young learners towards thinking rationally, motivating them to ask questions and endowing them with purposeful learning. SAI Angan unravels the amazing wonder world of Chunky, the monkey and makes it come alive in the city of Bhubaneswar. An environment of love, affection, understanding, care & learning, SAI Angan is designed like a castle from a fairy tale providing an impetus for the child not only to come to school but love it just the same. We have adapted features of Disney World that nourishes the upbringing of children and igniting in them the spark to learn with happiness and joy. We aim to unleash each child’s imagination and creativity by providing an environment which they relate to through an element of fantasy and wonder. The other highlights of the School include 50,000 square feet of play area, 2000 square feet of swimming pool, toy train to move around during school hours, amphitheatre, sand pit, play stations having 30 options to enforce learning by the play-way method, activity rooms, music, art and computer labs and an auditorium. SAI Angan also has a fully air-conditioned creche facility for 200 children. It is an extended warm cocoon of love and affection. It follows a structured curriculum that includes plenty of time for physical activity, personal grooming time (including daily storybook sessions for groups and individuals), group activities, individual activities, meals, and rest. SAI Angan follows the Learning and Growing through ‘Multiple Sensory Approach’ and at the core of our philosophy is the recognition that children can think & learn differently and that intelligence can be expressed in a multitude of ways. Our multi-faceted approach to teaching incorporates each of the eight major intellectual domains, and provides opportunities for each student to use his/her unique intelligence to understand the subject matter. In addition, the multi-sensory approach helps students understand their strengths and challenges. By using multi-sensory approach as a tool, students learn to use strengths to acquire new information and work on fully developing their knowledge in areas that are a challenge for them. Children in the age group of 2 to 7 years will be more evolved and acquire prolific advancements through the progressive teaching-learning methods and research techniques which are applied at SAI Angan. India’s largest Play School with in depth researched and contemporary techniques of learning in early childhood. SAI Angan – An experiential and differential world of learning. 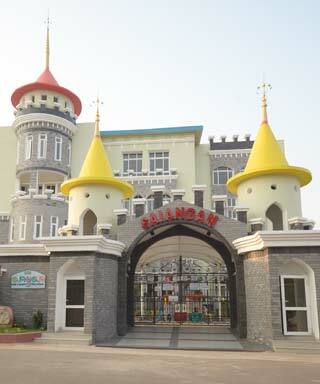 Play School with a total area of 150,000 square feet – A trend setter in early childhood education in the country. School building designed along the lines of Disney World. Play School unleashing creativity in children. A toy train to move around the school during school hours. A single collective outdoor area synonymous with play-stations having thirty different playing options to enforce learning through the play-way method. Each classroom – a complete learning zone – specially designed to nurture multiple intelligence. Fully air-conditioned crèche facility for 200 children – a safe cocoon of love, warmth and affection with continuous learning. 2000 sq ft of magnificent pool area for swimming.